I've often heard new knitters say they'd like to progress beyond garter stitch scarves but then balk when I suggest that they try lace knitting. 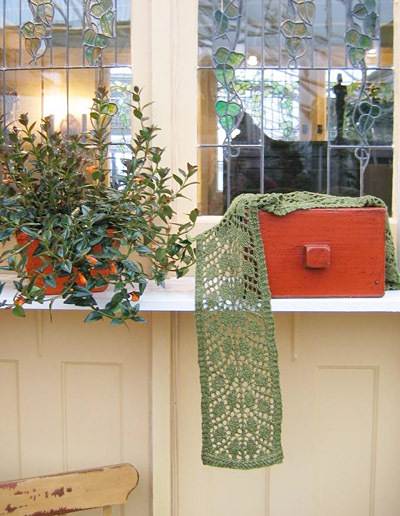 This scarf incorporates an easy, leaf-motif lace pattern for those willing to "branch out" from garter or stockinette stitch. 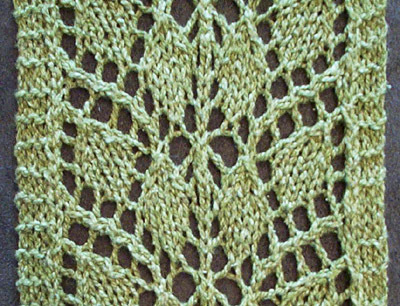 The lace pattern used in the scarf is a slight variation of "Leaf Shadows" in Barbara Walker's Second Treasury of Knitted Patterns. Although it is fairly simple, the pattern incorporates all of the most common increases and decreases used in lace knitting. So, once you've knit this scarf you can knit just about any lace pattern. Also, I encourage everyone to knit the scarf by using the chart. I find that knitting from a chart is much easier than knitting from written instructions. The scarf can be knit from any yarn. However, if this is your first lace project, the Elsebeth Lavold Silky Wool is an excellent choice. It is extremely soft and light-weight, it does not split, it is easy to frog or tink if you make a mistake, and it has wonderful stitch definition. 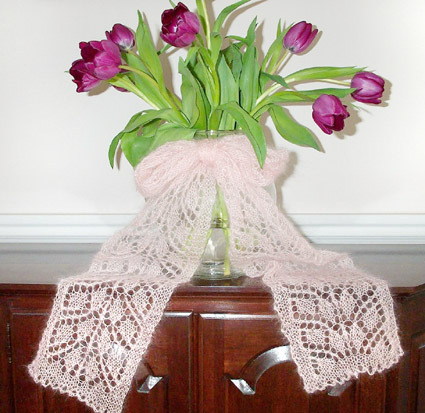 If you are a more experienced lace knitter, the Douceur et Soie makes a beautiful, feather-weight scarf. Work 5 rows in garter stitch (knit each row). 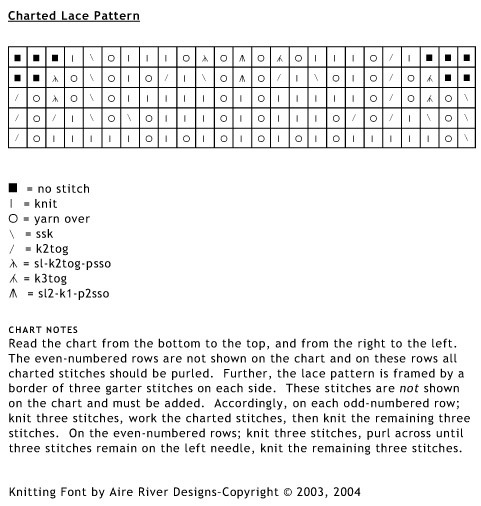 Begin working lace pattern following either chart (and Pattern Notes) or written instructions below. VERY IMPORTANT: If you are knitting from the chart, it is imperative to read Pattern Notes before beginning! Repeat Rows 1-10 until the scarf is as long as you like it or until you are almost out of yarn. You should be able to complete twenty-seven pattern repeats if you are using the Silky Wool yarn and thirty-six pattern repeats if you are using the Douceur et Soie yarn. Work 5 rows in garter stitch. Weave in yarn ends. Soak scarf in cool water until thoroughly wet. Gently squeeze out the excess water. Place the scarf between two towels and press out more water. Block by pinning the damp scarf on a flat surface. Remove when completely dry. Susan is a former Bostonian now living in Utah. She chronicles her obsession with sock knitting and her relentless efforts to knit up her stash on her blog, I'm Knitting As Fast As I Can.